Scrap and Stamp with Friends: Release day at Spesch Designer Stamps! Release day at Spesch Designer Stamps! Today is the Release day at Spesch Designer Stamp on all amazing images which we have Preview the last few days. You can get them in the Spesch Designer Stamps Store . 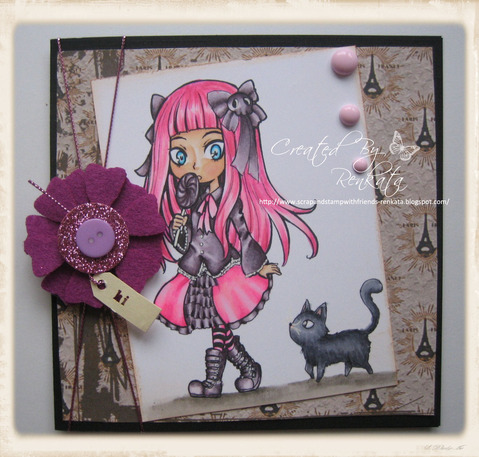 Today I am showcasing the cute "Goth Girl" digi image by Max. She is coloured with Copics in hot PINK and dark purple. I really like how she look ,lol. Make It Colourful - Colour with PINK. Just gorgeous. Love the colours. She looks awesome. Great work as always. je kaartje is prachtig geworden, Renkata! Merry Christmas with "Pat a Cake"! Friendship warms the heart !! !